I randomly stumbled upon Sarah Nourse’s YouTube channel a few weeks ago and I’ve been hooked ever since. Sarah is in her late twenties and travels around the world with her husband, Matthias. She is debt free after listening to Dave Ramsey and following his Baby Steps. She affords to travel because after becoming debt free she and her husband worked non-stop for three years and saved their money so they could buy a house in cash (the Dave Ramsey way). When the time came to buy, they decided they weren’t quite ready to commit to a house. Feeling unfulfilled and wanting more from life, they quit their jobs, took their cash, began traveling the world and building their businesses ever since. They’ve been doing this for the last year and counting. Sarah is also a vegan and a newly converted minimalist. Sarah inspired me on so many levels. After binge watching these videos, I began to re-examine my values about money, how I live, and my clothes. This is why the internet is amazing. You can surround yourself with like-minded people without actually being around them physically. If people in your environment aren’t doing what you think you should be doing (whether that’s getting out of debt, saving money, or something else), find a way to connect with people online who are. It will enable you to have the right frame of mind to focus on your goals and live according to your values. With my recent inspiration from Sarah Nourse, I decided to change things up a bit with my money, my stuff, and yes, my clothes. I’ve paid off more than $100k in student loan debt, and it feels amazing. But, I still have $105k-ish to go. I’m consistently paying $1,500 per month on my debt, and sometimes a little bit more. But life is somewhat comfortable now. I live on very little and still have money left over to enjoy life. I don’t use credit cards (I never have), so I know I’m not getting into consumer debt. But if I’ve learned anything from all this personal development training I’ve done, it’s that comfort is the death of dreams. Meaning, if I want to kick a*s and pay off my debt asap, I need to kick it into high gear and not be so comfortable. What I am going to do is be more extreme with my discretionary spending so that I make sure that almost every extra dollar I have goes toward my debt. I’m using my Budget Spreadsheet Bundle to make sure I stick to my budget. I want to repay my student loans in two years, so that means increasing my payments drastically. This will also mean making more money blogging so I can make this happen, too. I’ve also talked to Tyler, my boyfriend, about this change. We talk about money together and keep each other in the loop about our finances. We talk about how we would like things to be in the next stage of our relationship, and we are both on the same page with my debt – pay it off as soon as possible. It’s really important to me to be on the same page with my partner financially, so this feels good to have it worked out with Tyler. So, that’s where I’m at with my money – I’m recommitting to zealously pursuing a debt free life. The next area of my life that is changing is how I live in my home and the clothing I wear. I am ruthlessly donating and selling some of my stuff so that I’m not storing extra things I don’t use or want. I’m decluttering like crazy. I was never that cluttered to begin with, but I definitely have accumulated more stuff than I need or use in my 700+ sq. ft. apartment. And, I’m going to stay in this apartment despite it looking like a jail from the outside. It’s amazing how little you actually need to be happy. Once you start looking at your stuff this way (focusing only on what you need), you realize how much is unnecessary. I’m also changing up my clothing and overall personal brand. Instead of going with the latest trend, I’m focusing on neutrals. I chose neutrals because the colors are really easy to find and coordinate with each other (black, white, tan, navy, gray, etc.). You could do this with any set of colors you like, though (e.g. : pink and teal). The great thing about neutrals, is that you can implement this everywhere in your life – not just clothing. Everything matches so I always have something to wear. I need fewer items, too. When I’m in a store, I immediately disregard everything except neutral-colored items. This is really helpful for me because I’m naturally spendy, so it keeps me in line by having a strict rule to follow. I’m not going to donate and sell all my clothing that isn’t neutral right away. But slowly, over time, I’m going to weed that clothing out and only buy clothing that is neutral. I started by donating two large trash bags full of clothing last week. For now, that will work. I’m not going to get rid of my decor and buy new stuff that’s neutral right away (I don’t want to spend the money!). But, I did clear off my desk and make changes that I could in my home for free. Over time, I’ll adjust my decor. The idea for me is to have my clothing, my home, and my personal brand all be cohesive. The value of doing this is to make my life simpler and less cluttered so I can focus on what’s really important to me. I understand this may not work for everyone – especially if fashion or home décor is your thing. But I’m not into fashion or home decor. They’re not my things. I just want to look nice and have a nice looking home. So, implementing a strategy for my clothing and home is helpful because it makes my choices easier. Without so much clutter, I have time to focus on what’s really important to me. The actionable takeaway here is that you should fill your head with information that supports your goals. Whether that’s from listening to podcasts, reading books, or getting personal coaching – do whatever it takes so that your head space is fully focused on your values and goals. Without the constant motivation, you’ll fall into the trap of doing whatever it is the people around you are doing, which may not fit into your goals. People in my personal life aren’t focused on getting out of massive student loan debt. So, it’s critical that I spend time filling my head with motivation from people who are. Otherwise, I’ll slip into a pattern of doing what other people are doing when they have completely different finances than me. I did this by listening to Dave Ramsey and Suze Orman years ago, and now, I’m doing it with Sarah Nourse. It may not seem like reading and listening to podcasts can be that powerful, but they are. Whatever you focus on will be where you move toward. So, focus on something that takes you where you want to go. You have to be intentional about it. It won’t just happen. That is why I am renewing my commitment to get out of debt with laser-focused intensity. I don’t want debt to be a part of my life. I want the freedom a debt-free life affords. I’m also simplifying my home, my clothes, and my brand by decluttering and focusing on neutral colors. This is means less stuff, fewer decisions to make, and a simpler, happier life. It’s amazing how good it feels to focus on what makes you happy and ruthlessly cut out the rest. 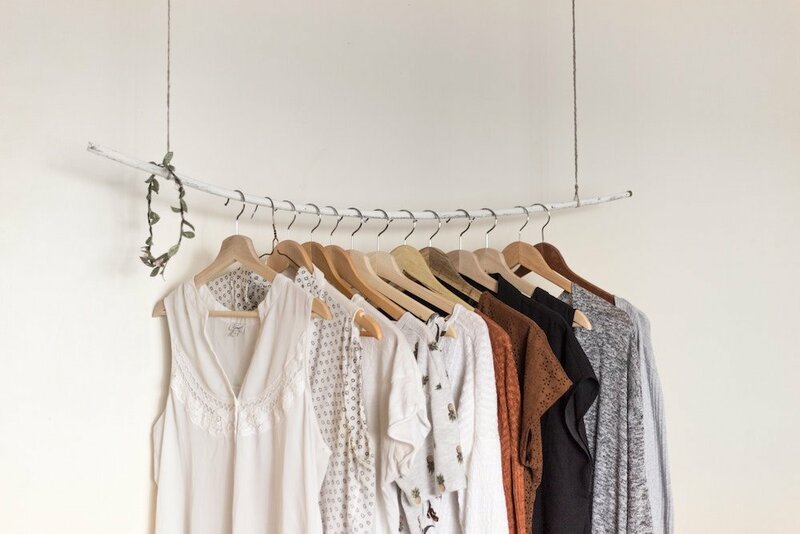 I like the idea of simplifying your wardrobe to focus on neutrals… it sounds like a great way to not only brand yourself, but to make the shopping and coordinating outfits a bit easier every day! It’s amazing how much resources we have available on our finger tips with the internet. And the fact that we can surround ourselves to like-minded individuals. Thanks for sharing Sarah’s channel, looks like a lot of fun. Good luck with the new goals! I used to listen to it on the Podcast app on my iPhone, but I’m not sure if it’s still there. That’s awesome! I’m glad you can always pay it off every month – that’s what important! I definitely need to work on that as well. Everything, because I am currently in debt from school loans as well. This was a great read and it’s given me renewed focus, to keep on the right path. Thanks, Crystle! I’m right there with you. Great post! I have simplified my wardrobe to neutrals and it has made a huge difference. Mornings are easier getting ready for work without decision fatigue. My closet is no longer packed and cluttered. I almost bought a custom closet to organize all my clothes but no longer need to – which saved me from wasting money! I have been slowly adopting minimalism and my closet was a great place to start. Less things = less stress! That is great to hear! I’ve heard similar things from others who have done this, so I’m hoping I experience the same thing! Another great and relevant blog. I spent 10 years paying off all my debt and getting rid of my house and clutter. I also socked away $30K in my emergency fund, maxed out my 401k and Roth IRA, and bought a new 2017 Jeep Grand Cherokee with cash. The journey sucked and once I got to the finish line, I wasn’t all that excited. Kind of disappointed it was over. I wouldn’t ever advocate being in debt, but if you are laser focused to get out of debt, have some kind of plan in place for the afterwards. I didn’t and now im a cat with no debt, cash in the bank, paid off new vehicle, and trying to figure out what to do next to achieve a somewhat happy level where I can enjoy the fruits of my labor. What an amazing story!! Congratulations on all your success. That’s awesome!!! Excellent! I’ll listen to David Ramsey on podcast. You are admirable in slaying the debt monster- it is not a good way live anyway. But don’t overdo it, remember to have a little fun along the way so as not to burn out, you never know when you may have to cash in your chips…..
Hello Natalie, clothing is one of the important part of our life. As people judge you by your clothes nowadays. I agree with you that we have lots of resources now to know about many more. Thanks for sharing such an informative blog. I will always remember all these points. Keep posting! Spot on. Wish I had read this 15 years ago. However, it’s never the wrong to prioritize your lifestyle by simplifying.